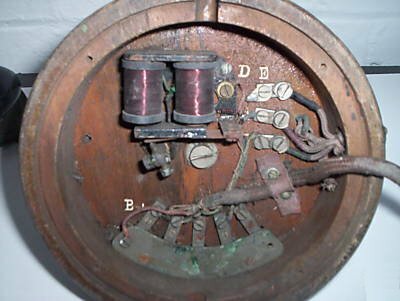 The Central Battery Domestic Interphone is intended for use under conditions in which a neat and simple telephone is required, such as in private residences, small suites of offices, etc., where it is unusual for more than one conversation to be necessary at one time. It consists of a hand combination, cradle support, selective ringing keys, call buzzer wound to 5 ohms, flexible cord, and connecting wall block. This telephone is also supplied as table pattern as illustrated above. An ingenious feature of its design enables the set to be quickly converted into a wall set. The cabinet work is of well-seasoned walnut; external metal parts are finished in oxidised copper bronze. With each installation a K 7863 Battery Impedance Coil is necessary, comprising coil and terminals mounted on a brown Bakelite base, with cover. 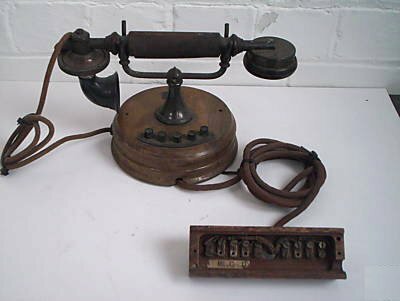 The telephone is equipped for 5 lines; it can also be used as a central station set to work in conjunction with the instruments K 7735, K 7746, K 7750, K 7790 and 7796, as sub-stations, to ring and speak both ways to the central station only. In this instance the K 7863 is not required. These instruments will not work with K 7887, K7888, K 7907, K 7913, K 7953 & K 7967. Weight, 3 lbs. 6 ozs. Dimensions, 6.5 x 10 ins.